Statistics from a Closed Circuit TV supplier show that the Land Rover Defender is now Britain's most easily stolen vehicle. This is actually nothing new. They, along with Mercedes Benz W124 saloons and estate cars, are both easily stolen and have a huge ready market for parts in Africa. We even had a letter from a reader whose family Defender had been towed out of a supermarket carpark by an Astravan (on fake plates) and never seen again. Now that production has ended and the last Defenders off the line are regarded as appreciating assets, the problem has become worse. Barely a day goes by without a report of yet another Land Rover Defender stolen somewhere in the UK. Figures published by the National Vehicle Crime Intelligence Service show the Land Rover Defender as one of the top ten stolen cars nationally. The NVCIS has also warned that, while the tried-and-test method of stealing the car keys from the hall table and simply driving the car away remains a popular choice among opportunist thieves, keys from older vehicles will work in the door locks and ignitions of Defenders. Stolen to order, late plate Defenders are exported and resold in other countries: mostly eastern Europe and Russia, but also as far afield as China. And that's in addition to older Defenders stolen for parts for export to Africa. 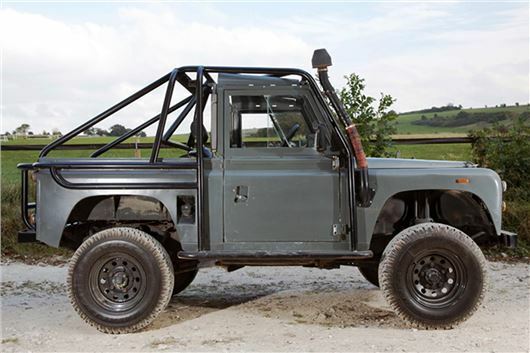 What can Defender owners do to protect their four-wheeled investments? Obviously, CCTV.co.uk has an interest in selling closed circuit TV camera systems. But that won't help if the theives are masked and use a cloned vehicle to tow the Defender away. · High-quality steering wheel and gear stick locks, such as the Disklok from Halfords. · Think security every time you leave your vehicle – are doors, windows and sunroof all shut? But even a Disklok will not prevent a locked Defender from being towed away for the Disklock to be ground off the steering wheel somewhere else. "Using your garage is a very good point indeed which many people don't even consider," the police say. "How many people use theirs for a few hundred pounds worth of garden tools and household items, while a car worth tens of thousands sits unprotected on the drive?" While police throughout the UK struggle to catch up with the prestige car thieves, it's down to owners to protect their vehicles as best they can. If you have a garage and the car will fit inside, use it. If not, consider strong security gates, wheel clamps or retractable armoured pillers as lines of defence to defend your Defender. ...or buy a Japanese equivalent that won't break down, can actually drive on-road like other cars and has sufficient security, all at a lower price (including running costs) than the LR.